To promote relaxation, stress reduction and circulation improvement. This is geared toward chronic stress in muscles and tendons due to work and sports related pain, commonly seen in nurses, firefighters, police officers, trade workers and sports enthusiasts. Treatments include relief for tennis elbow, golfer’s elbow (not always caused by these activities), carpal tunnel syndrome, plantar fasciitis, chronic torticollis and post exercise muscle soreness. Being a mother of four children I understand that children like adults have similar mental health and physical health needs. Many children today suffer from stress and anxiety and benefit from a calm wellness massage. Some children are very physically active and benefit from a more specific treatment massage with recommendations for home stretches or exercises. Throughout my practice I have treated many children of all ages. I recommend that a parent remain in the room with their child while being treated for the comfort of the child. With older children, or children who are used to massages, I let them decide but ask that the parent remain in the waiting room. It is important for the child to know they are in control of their treatment and I keep in constant communication with the child regarding areas of treatment, pressure and techniques. With the many stages of pregnancy and the changes that occur to the body throughout the three trimesters massage can be of great benefit to reduce the aches and pains that occur. I have a great understanding of pregnancy both personally and professionally in both my professions as a Registered Nurse and a Registered Massage Therapist. Before every pregnancy massage, I review with the client any possible cautions or contraindications to massage based on their medical and pregnancy history. I have specific pregnancy cushions that allow for better support and comfort throughout the massage, at all stages of pregnancy. Communication is a key factor to all massage and I emphasize that the client should feel comfortable and feel that they can speak to me about any concerns they may have before during or after the massage. Cupping therapy has gained great popularity after the 2016 Olympics when Michael Phelps was covered in the circular marks that can be left by cupping. 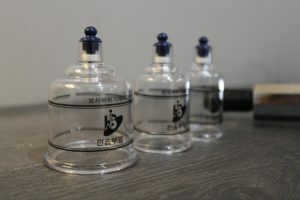 Unlike the ancient Chinese art, the type of cupping that I do is not done with any flame, but with either soft silicon cups or hard plastic cups with a suction. They are used to treat pain and work well with chronic conditions of reoccurring soft tissue conditions. They work by lifting the tissue instead of compressing as massage does. Cupping can be done in a static way, where the cups are left on in one place or they can be moved around to help break up fascial adhesions and muscular pain. The cups bring more blood and circulation to the area (which is why they can leave a purple bruised looking circle) to help the healing process, promoting the inflammatory response and brings antibodies to the area. It can be very effective on scar tissue that feels like it is stuck or tight muscles that just don’t want to release with stretching. Before having this treatment, a complete health history is important as there may be contraindications to having this treatment. Many people seek massage for a variety of reasons, it is important to let me know what type of massage you would like. 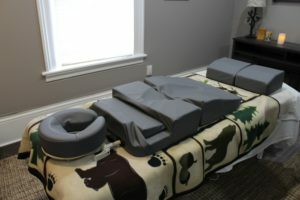 Treatment massage is more focused on relieving pain in a specific area, and benefits from multiple treatments over a short period of time to successfully alleviate the pain. It is unusual to be completely pain free after one treatment especially, if it is a chronic or reoccurring pain. Due to the repetitive nature or postures that we do in our every day lives we all have specific areas that are prone to chronic pain or achiness. Regular massage is recommended even after the pain has decreased as a way of prevention from reoccurrence. A wellness or relaxation massage can be helpful for reducing the everyday demands from building up and causing stress and anxiety. Massage has been known to bring about a state of relaxation by stimulating the parasympathetic nervous system, which is our rest and digest system. It is helpful to book regular appointments to help maintain and prevent stress from building. Many people like to combine the two types of massage and that is okay too. If this is the case it is best that the area that needs treatment be addressed first and the wellness component of the massage occur second so that the client leaves feeling relaxed. Massage services are offered to all ages from children to adults. Massage is a great way to help reduce your daily stress and maintain a sense of wellbeing over the course of a lifetime. Massage is also used to treat specific soft tissues, such as muscles, tendons, fascia, restoring them to a more functional level and assists in pain reduction due to alterations in the soft tissue occurring over time or from injury. For your convenience we offer a variety of massage appointment times. Longer appointment times best suit wellness massages, where shorter appointment times are more suited to specific injury or treatments of chronic conditions such as tennis elbow.